In an alternate universe where all bike tests utilize the exact same parts spec, and only the frame is judged, the GT Sensor Carbon Expert might just sweep the awards podium. Indeed, this 27.5-inch 130mm trail tamer employs a novel new suspension design, longer wheelbase, and low-slung geometry to create a bike that climbs well, steers with razor precision, and descends with stability, ease and confidence. 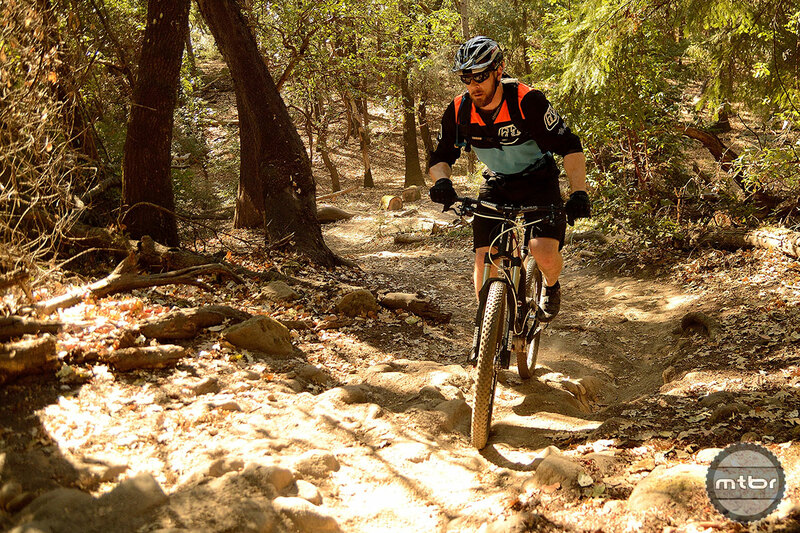 During our time in California’s Soquel Demonstration Forest, testers raved about the bike’s ability to tackle a variety of tasks—and do them well. Minimal pedal bob, snappy and fun, quick responding, and moments of ecstasy were all phrases associated with the GT Sensor Carbon Expert. Alas, “WTF” was also a common refrain. Masking the good manners of this $4880 bike is a laundry list of head-scratching—and often underperforming—parts that includes a noodly fork, sub-par brakes, wimpy tires, a rock-hard saddle, and an out-dated triple chainring. And therein lies the problem with this bike. No matter how good the frame is, it’s hard to justify a near five grand outlay for what amounts to a teardown where the foundation is kept, but the rest of the proverbial house is in need of serious updating. But that’s getting ahead of ourselves. Let’s first talk about the good. The backbone of the entire Sensor platform (which also includes the $9220 Carbon Team, $7050 Carbon Pro, and $3800 and $2820 alloy versions) is what GT calls its Angled Optimized Suspension or AOS. The big picture idea behind AOS is that by utilizing a high pivot point, the rear wheel moves upward and backward, which gets the wheel out of the way of obstacles more effectively, making for a more capable and playful ride. 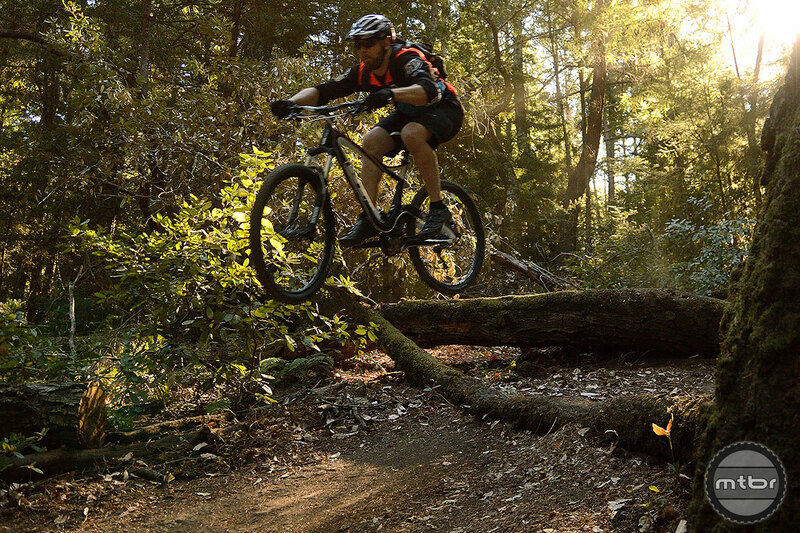 At the same time GT has countered the most prominent complaint leveled at high-pivot designs (poor uphill performance) with what it calls PathLink, where pedal feedback is minimized by controlling chain growth and isolating rider input from suspension performance. You can see a nifty illustration of all this in the video below. 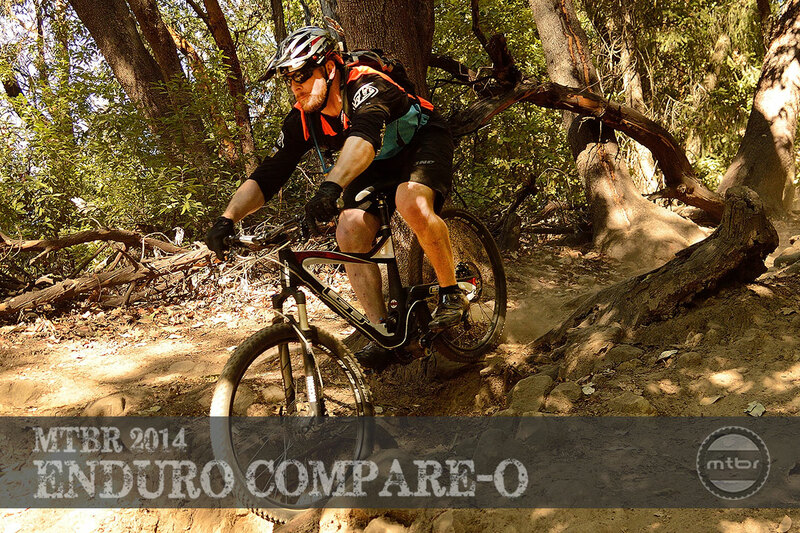 On the trail, testers were roundly impressed with AOS and the entire frame design, especially in rolling terrain. “This is really the bike’s comfort zone,” said one tester. “The 27.5 wheel platform made it snappy and fun, and the low bottom bracket (13.2 inches) allowed me to easily pop in and out of turns. However, one tester did encounter some slight tire rub when landing jumps or diving hard into off-camber turns. Uphill ride performance was also primarily praised. Pedal bob was minimal, and the larger rollover of the 27.5 wheels helped the Sensor Carbon Expert claw over chunky trail obstacles. If we could just slice some weight off the somewhat hefty 28.04-pound scale reading, climbing performance would be even better. Like many of the bikes in this test, the Sensor Carbon Expert comes stock with Fox’s 130mm Float CTD shock. For the sake of comparison we spent time in all three settings, but found that in nearly all cases the Trail mode was plenty stiff when it came time to climb. There were even occasions when the extra squish of Descend helped the bike keep traction on more challenging, rocky uphills, maintaining rear grip without causing unwanted bobbing. Turns out this lack of mode changing is a good thing because it’s a long—and potentially precarious—reach to get your hands on the lever while underway. Best to wait for a mellow section of trail before trying to switch things up. Additionally the shock is tucked so deeply inside the frame that you can’t eyeball the o-ring when in the saddle. GT has included sag indicators on the frame, but you’ll need the help of a riding buddy to read them. The upside of keeping all this weight so close to the ground is that the bike’s low center of gravity and low BB gives it amazing snappiness, especially when faced with a series of tight switchbacks. “I banged my pedals a few times,” admitted one tester. “But the tradeoff was how fast you could throw the bike around. It felt really stable and whippy at the same time. Are you reading this Seplavy? Your parts spec is a joke!! A triple in 2014, seriously? GT’s US site lists the Sensor as a TRAIL bike. It would have been more appropriate to review their AM bike which is the Force Carbon Pro which has the Fox 34 up front, but retains the 3×10 drivetrain. The frame is available by itself for their trail, am and enduro bikes on the Canadian website.